To end this week's series of bookmarked recipes, check out these multigrain pineapple pancakes. I feel these multigrain pancakes are glorified Dosas which are the current generation's favorite. I alter the ingredients and fruits and try out various combinations. My little one loves pineapple and so the pineapple walnut combo is made more often. Whisk in the flours, baking powder, cinnamon powder, sugar and salt. Add in the walnuts and coat them with the flour. Blend the flax seed powder and water and set aside for a couple of minutes. Pour the flax seed water into the flour mixture and gently mix to make a lump free batter. Add buttermilk to get the right consistency. Fold in the pineapples into the batter. In an effort to reduce rice in our diet, I have started to replace part of the rice with oats in Idlis and Dosas with very little difference in taste. After trying out out different proportions, I figured that this proportion works best for our family. Wash and soak Urad Dal and fenugreek seeds for about 3-4 hours. Wash and soak Rolled Oats separately for an hour. Drain and grind all of them into a fine batter. Soak Idli Rava for 30 minutes and mix into the batter. Add salt and set aside for fermentation. This 2-ingredient dough is a multipurpose dough. It can be used as a pizza base as well. In one of our group chats, there was a discussion of no yeast garlic bread. All the while I was flipping through my memory folders to figure out where in my notes I had written down such a recipe. When I found my notes, I immediately set out baking these garlic bread sticks for a quick after school snack for the kids. Dump the flour and yogurt in a stand mixer with the dough hook and let the mixer do the job of turning out the pliable dough. Knead the flour in a mixing bowl with your hands and exercise your arms until it results in a pliable dough. Mix in the butter, grated garlic and dried basil and set aside. Roll out the dough into desired shape (oval) of about 1/4 inch thickness. Spread the garlic butter evenly all over the rolled out dough. 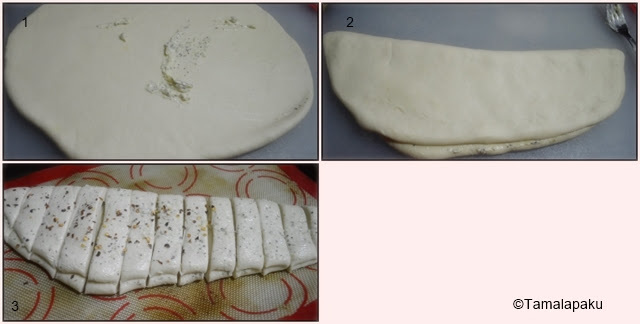 Fold the dough to resemble half of the oval shape as in the picture. Spread the garlic butter on the top and make markings on the dough at 1 inch intervals so it is easy to pull the bread sticks out. Preheat the oven to 425 °F. Bake for about 18-19 minutes or until the top is golden brown. Serve warm with marinara sauce. These Quinoa Moong beans crepes are a variation of our very own Pesarattu. These make a delightful addition to the breakfast table. Needless to say that these can be categorized as protein powerhouse. Soak quinoa and moong dal for 3-4 hours. (I soaked overnight). Drain and grind into a fine batter adding ginger, green chillies, coriander leaves and water as needed. On a hot griddle / tawa, pour a ladle full of batter and spread it into a thin circle. Sprinkle finely chopped onions on it, spray a little oil all over and let it cook. Flip it onto the other side until cooked. Serve it hot with a chutney of your choice. These Eggless Vanilla Crepes are very versatile with very basic ingredients. Flour, sugar and milk should be more than enough for these humble crepes. The dressing up of these crepes is all together a different ball game. The options are limited only to your imagination. I have used whipped cream, chocolate syrup and banana. I would have loved some strawberries as well. The first time I thought about these crepes is when my older one had a life skills class where they were taught how to make these. She fell in love with these crepes but her love for these crepes was soon forgotten. When I made these as an after school snack today, she was all smiles and loved it once again. Both the kids assembled their crepes and allowed me to click the pictures :). In a mixing bowl, add the flour, salt, baking powder and powdered sugar and whisk well. Mixed vegetable manchurian is always welcome as part of any meal at our place. Here is my healthy take on this delight. Last year around this time, I gave in to my impulse and bought this gadget called the Air Fryer. For most part, I used to make French Fries in them and later on started to reheat fried goodies. As I got used to it, I experimented with manchurian. I found no difference between the fried version and this air fried version. To be frank, they tasted very dry as is but the manchurian sauce transformed it to the sinful version! Mix all the ingredients listed under the 'For veg dumplings' except oil and make about 30 equal portions and make dumplings. Preheat the air fryer for 3 minutes at 375 °F. Arrange these dumplings in a single layer. They come out beautifully browned. Repeat the process until all the dumplings are done. The air fryer I have can accommodate 10 dumplings at a time. While these dumplings are being cooked, prepare the manchurian sauce. Check out the Blogging Marathon page for the other Blogging Marathoners doing BM# 82. This is for Srivalli's Kid's Delight event, guest hosted by Sapana, themed on Bite Size Appetizers. After the healthy bites which I posted yesterday, here are some roasted potato cups which are loaded with guacamole. These are made with red potatoes and personally, I love the look of those cute cups. They were adored by the kids as well. When I served them with a filling of guacamole, they were very happy. Wash and wipe the potatoes dry. Slice them into halves. Scoop out the flesh of each of the potato using a melon baller. Spray olive oil so all the potatoes are evenly coated. Mix the spices in a bowl and sprinkle on the potatoes evenly. Place all the hollowed out potatoes on a lined baking tray. [I baked the scooped out cuties as well]. Place the baking tray in the middle rack and bake for 15 minutes, flip all of them and bake for another 10 minutes or so making sure the potatoes are all cooked and lightly crispy. Remove from the oven and allow them to cool. In a different bowl, add guacamole, corn, onion and tomato and adjust the spices. In each of the potatoes, scoop in the guacamole and garnish as needed. Assemble all the potatoes and serve immediately. These cheesy quinoa bites make a delightful snack. This is a good way to sneak in those vegetables which are a no-no for the kids. This week it is all about bite sized appetizers which are kid friendly. These bites disappeared in a flash and no one commented on the quinoa in there. That was a pleasant surprise. Wash and cook quinoa and allow it to cool. Mix in the flax-egg, cooked vegetables and the spices. Add the shredded cheese, adjust the taste as needed. Grease the mini muffin pan and divide the quinoa mixture into 24 equal portions. Bake for about 20 minutes or until the mini muffins are firm and slightly crispy. Remove and allow them to cool before serving them with ketchup. In fact these noodles were enjoyed by the whole family with a generous helping of tofu to the side. Boil the hakka noodles as per the instructions on the pack. Wash in cold water and spread the noodles in a single layer. While the noodles are cooking, in a heated wok, add in the vegetables and stir fry them until they are cooked but retain a crunch (about 7-8 minutes). Add in the sauteed tofu and the schezwan sauce. Sprinkle salt as needed. Add in noodles and gently toss them around so the sauce is well coated. Serve them hot for a filling meal.